TCP Statistics provides an information about TCP segments. 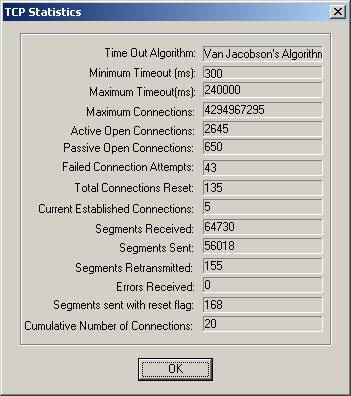 The TCP statistics dialog shows the details about TCP segments including timeout algorithm , minimum and maximum timeouts in milliseconds, the number of maximum connections , opened active and passive connections, failed connections, reset connections, currently established connections, received segments, sent segments, retransmitted segments, received errors, segments, which have been sent with reset flag, cumulative connections. All fields are updated automatically for each received TCP segment.